• Eight in ten people surveyed have given money in the past 12 months, either to a charity, to a church or religious organisation, or by sponsoring someone. • Donors said they are most likely to give money because they believe they can make a difference, and because they want to help those less fortunate than themselves. 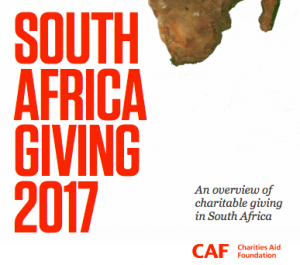  • Amongst those who donated in the past 4 weeks, the typical donation was R500.  • The most common method of donating was via a donation box in a supermarket/shop, which 40% of donors had used.  • . Six in ten people surveyed have volunteered in the past 12 months.  • The most popular cause amongst donors and volunteers was helping the poor.  • . Over half of those surveyed say having more money themselves is the thing most likely to encourage them to donate more.